After a 3 week break since China and a much needed vacation for myself, Formula 1 returns to Europe. Well almost, since the Istanbul part is on the Asian side. But still. The track had its debut in 2005. The winning car back then was the awesome MP4-20 designed by Adrian Newey. The driver was Kimi Raikkonen. The car held together nicely for that race but failed to do so in other crucial moments costing Kimi his first title. Would the Newey designed RBR7 finally rack up a win here? They were on pole in 09 and 10 but so far failed to climb the highest step of the podium. I doubt a lot of people would have bet against Sebastian Vettel claiming a fourth pole position in a row this year. But a Friday crash in the very wet first practice session left him with a severely mangled car. So bad that the team was unable to fix it for Practice 2. What is worse is that some of the new updates on the car were destroyed and could not be put back on the car for this weekend. Including a new front wing. So with no dry running before Saturday, Vettel looked to be at a greater disadvantage than he had been at for some time. When Kimi claimed pole position here in 2005 he did it in 1.26.7. And that was with the mighty Mercedes 3 litre V10. Estimated to put out around 930 HP. Just about 200 HP more than todays V8s. The qualifying pace of today mostly has to do with being able to run the DRS rearwing as open as you like on the straights during qualifying. But it also tells a story of what the engineers of the different teams have achieved in terms of aero efficiency. 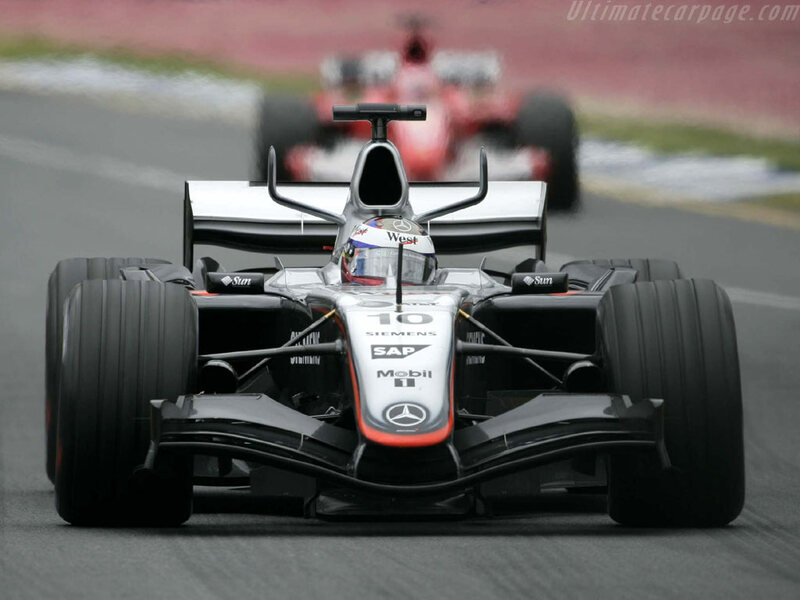 Remember the rule changes in 2009 – that was actually done to cut the downforce almost in half. All the cars in Q3 would actually have beaten Kimis time from 2005. Any way you look at it, that is impressive. Let me just get this off my chest. The race was an absolute classic. At least when you compare it to the races that we have been used to for the last decade or more. 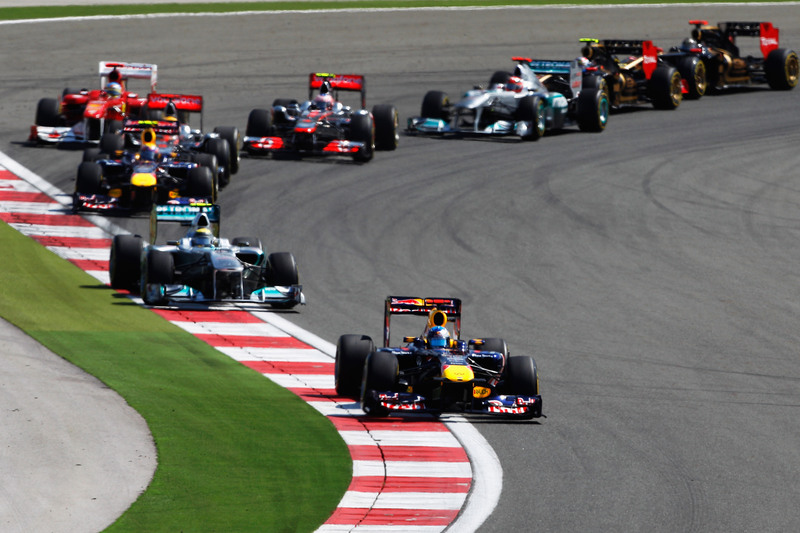 But with China fresh in our minds, it is clear that there is a new era of racing in F1 unfolding before our very eyes. There have been numerous attempts to spice up the show over the years. But in my opinion, the combination of the Pirelli tires and the DRS wing is by far the most successful by a mile. People on forums are even complaining that overtaking is too easy now. Good grief. First its boring and no overtaking and now its too much. I kinda get what they mean, you dont want it to be too easy. But give it some time. There is still much to learn on how long the overtaking zones and such should be. Its been pretty darn good so far but next year the organizers will know even more. Ok, lights out, go! Short run to the first corner and yet Rosberg gets the jump on Webber and slots in behind Vettel in 2nd. Hamilton is racy and fancies a go on Webber as well. But it ends in tears as he drifts wide and drops two places – now behind his teammate too. 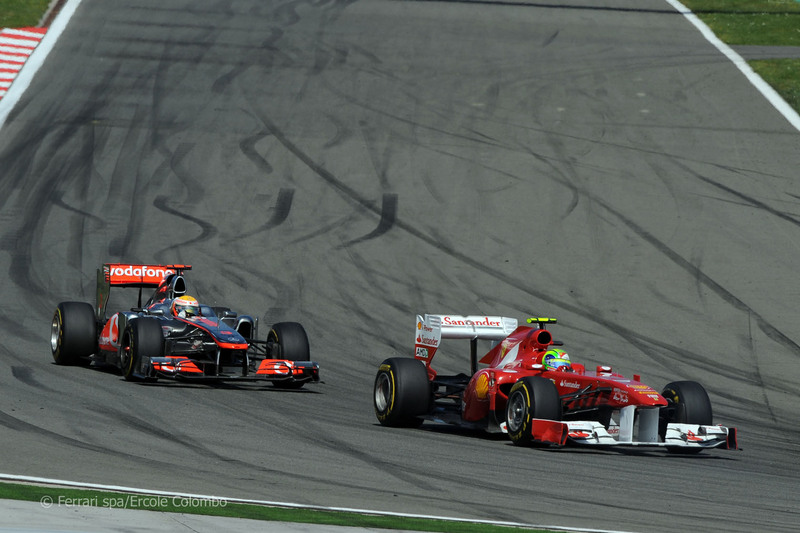 Alonso gets a good start for once and takes advantage on Lewis’ failed move and takes 4th. From then on its just a non-stop action/overtaking fest from start to finish. I used to be able to comment on every overtake in a race. That is over now. Even the producers didnt have time to show every passing move here. So I have to just focus on what I call some key moments. That means I will probably miss stuff that some of you think was important. For that I apologize in advance. We have the fight between Hamilton and Button. Back and forth. Magical. Remember the fight between them in Turkey last year? That was talked about a long time after. Well this was even better. I fear that we will become spoiled brats with this kind of racing. I have only used this phrase before when seeing Kimi do his dance on the limit – but I will make an exception. This race was pure eye candy. It really was. And before I get to be an overfed spoilt fat kid on too much candy, Im gonna savor every moment of it. And then there was the coming together of Schumacher with Petrov. Small .gif here: http://i53.tinypic.com/2ymhild.gif That was not so magical. In fact, it was pitiful. Petrov was so far ahead at turn 12 and still Schumi turned into his wheel and lost his own front wing in the progress. He went in to change his wing but his racing didnt really improve. He was fighting it out with midfield cars and sometimes you just wanted to look away from the screen. It was embarassing. I have long been a defender of Schumacher, and given him the benefit of the doubt. But now I have to join the choir that have been chanting that he is past it. Just do this year Michael and then get out. Dont drive the 3rd year as planned. And give the seat to Kobayashi or something. Please. Its for your own good. I also have to mention the fight between Massa and Lewis. That was crazy good. Right from the side by side moment in the pitlane to the fantastic scrap on the track. This eventually flows over into a Massa – Rosberg battle that lasts almost for 10 laps. Meanwhile Button catches up with the two and manages to go on the outside of Rosberg in the final corner. What a move! What about Vettel? Compared to the fighting and the mayhem going on behind him, he was having a quiet day at the office. He never looked pressured, never in trouble. Whenever someone tried to reel him in, be it Webber or Alonso, he just cranked his pace up a notch. That put his pursuers firmly in their place. As if to say, dream on – I got this. He conserved those tires so well that he could stay out a couple of laps longer than his rivals and still churn out competitive lap times. He made it look easy. Just as he made qualifying look easy. And it is the mark of a champion. 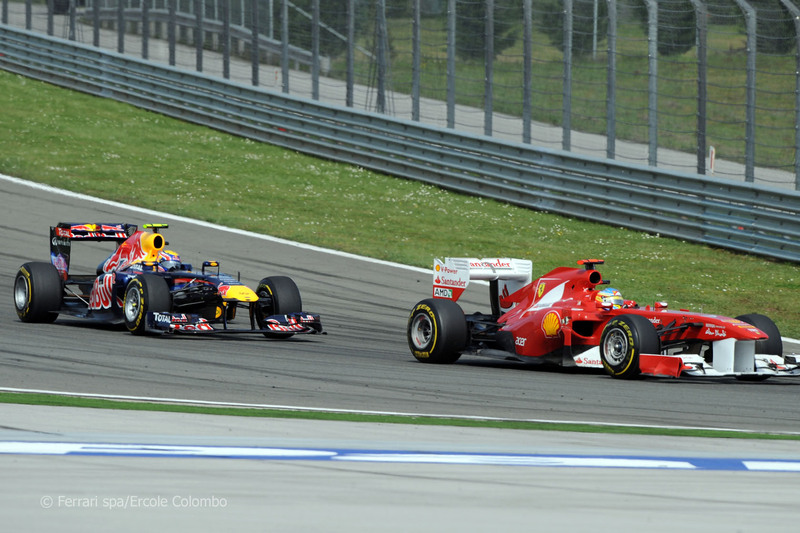 Alonso was having a good race and is now closing down on Webber. Such a strange sight knowing how much quicker that car is. At least in the hands of Vettel. An onboard of Webber shows a red blur go past on the outside at turn 12. Alonso takes 2nd. Nice driving Nando. Not so nice driving, Mark. In the “old” days, the final result of the race would pretty much be set in stone unless it started to rain. Not so in this new age of racing. After the final pitstop, (a 4th pitstop in fact. Something all the frontrunners did except Button) Mark Webber seemed to come alive again. He started reeling in Alonso by setting some quick laptimes. One of them the fastest of the race. And it couldnt be due to tires because they were one lap older than Fernandos. Could it be that the Red Bull car comes even more alive on low fuel for some reason? Which is why they dominate qualifying. Sure looks that way. Anyway, Mark does some fine driving and makes good use of his now functioning KERS and the DRS wing and does away with Alonso for 2nd place. Even if he has been completely outshone by his teammate, this is actually Marks best start to a season ever. 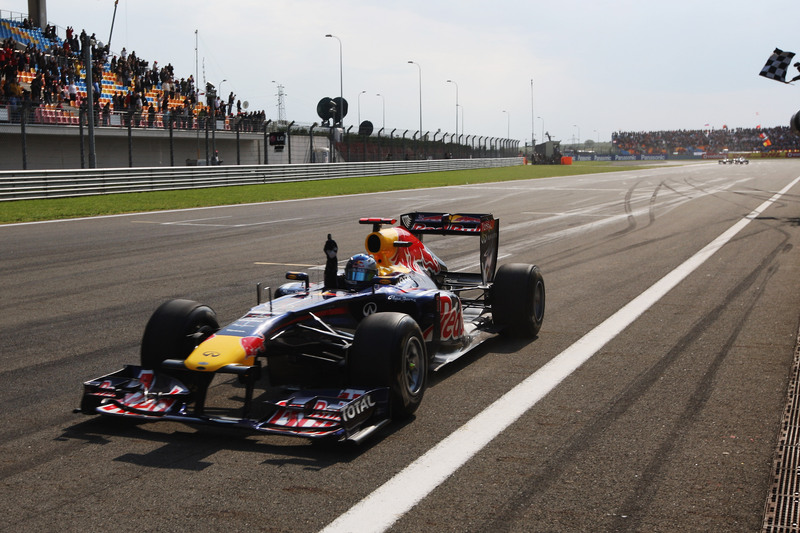 Vettel takes the checquered flag followed by Webber. Alonso gets Ferraris first podium of the season. It seems those upgrades helped some of the problems they had. Massa looked quite good in the early stages of the race but some very lengthy battles and a big mistake with a wheel in the pits saw him trailing home in 11th. Buemi and Kobayashi had a great race. 9th and 10th respectively. Buemi started from 16th and Kobayashi from the very back of the grid! Im sure Kamui would have finished even higher had he not had the tech problem in Q1. But the 3 stop strategy worked in both drivers favor. It didnt do the same for Button. He suffered a similar problem to what Vettel had in China. He looked set for a good finish. But then the hards on his car started to go and people started catching up with him. In the “old” days of F1, he could have defended his position to the finish. But not now. 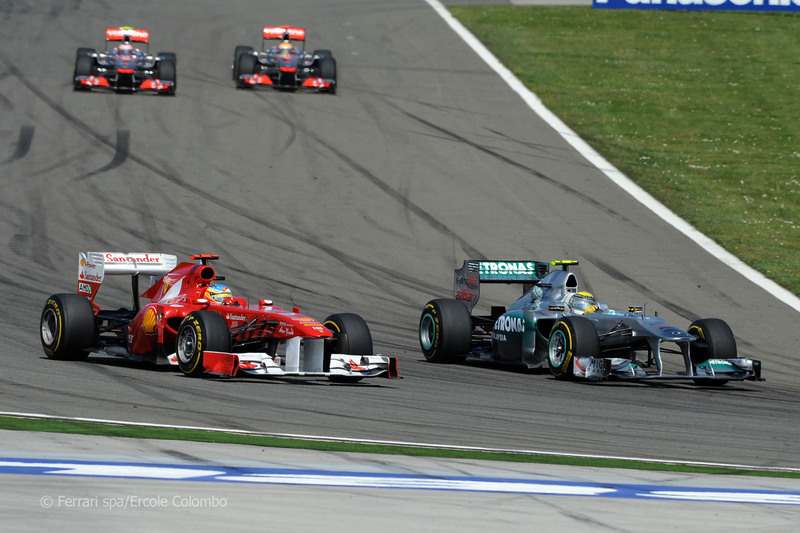 He was eventually passed by both Hamilton and Rosberg and had to settle for 6th place. Undoubtedly Vettel. Even if he was in front for most if the race, it is no easy feat churning out great laptimes over and over while you are preserving times. And responding now and then from the pace behind. Perfect race and a pretty much perfect season so far. He now has 93 points in 4 races. It took him 8 races to get to 90 points last year. Im just sayin’.. Unfortunately it is Schumacher. Unfortunately because I had hoped for a lot more from his comeback. But I think this race finally showed that he is no match for these young guns. I will be glad to be proven wrong but I doubt it. And his mysterious move on Petrov only put the nail in the coffin. So to speak. For me its a 10 out of 10. Maybe in a couple of years when we are getting used to this “new” type of racing in Formula 1, I would have given it a lower score. But right now its all good. When I watched the race again, I didnt scroll through it like I usually do. I just sat and watched because there was stuff going on all the time. Kinda like what I do if I come across The Shawshank Redemption. No matter how many times I have seen that movie, I dont change the channel. Driver of the day must have been Alonso! Nice review and for sure a good reading as usual. I have been lousy giving you creds for all those good reviews during the recent months (due to illness), but I have read every one of them carefully. I absolutely agree on your imperative to Schumi; “Dont drive the 3rd year as planned. And give the seat to Kobayashi or something.” And your “something” could even be interpretated into “someone special”, right?! Thanks laffen. Hope you are feeling better. Yes, I see your point. I believe they were trying to cover their bases in case people were 3 stopping. When the nearest rivals made a 4th stop, then he could afford one as well.